mytea@om: Fite Dem Back ! Its a very long time to accurately remember the exact details of the day's activities, but it was on Saturday 13th August 1977. We`d seen a Socialist Workers Party poster up at Camden Lock the week before advertising an Anti-National Front demo in Lewisham, with the slogan "They Shall Not Pass" reminiscent of the Anti-Fascists that stopped Sir Oswald Mosley`s British Union of Fascists walking the streets through the East End of London (Cable Street) in 1936...We thought, lets check this out!! Previously the NF had gained 120,000 votes at local elections across London and running battles at NF rallies around the country would culminate in one of the most bellicose riots the capital has ever seen. This flexing of fascist muscle threw down a gauntlet to a number of groups that rarely encountered each other, a politicised student movement grew on the events in Chile and Vietnam, militant trade unionism, (at the same time supporting a miners' strike) and increasingly self-aware asian and black youth, facing down the police and propelled by the militant tunes of Reggae and the events taking shape in South Africa. In the morning we jumped the tube from Gt. Portland Street to London Bridge and then on to New Cross...It was evident from the atmosphere on the trains that this day was not going to pass off peacefully. We really hadn`t much of a clue about who was who, as the train chugged into New Cross Station. On the platform, scuffles broke out between people who looked like my ex-teachers at school and what looked like ex-military types to me...Once out on the streets of Lewisham the air was thick with emotion. We set off making our way down to the Clock Tower on Lewisham High Street. 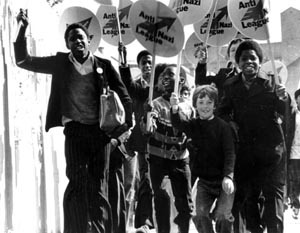 When we reached, the crowd was thousands strong, Trade unionists, students, local black and asian youth, a myriad of anti-racists determined to physically confront the Nazis and stop their provocative march through a predominantly Afro-Caribbean area of South-East London.. The NF march seemed to take for ever to reach, so the 3 of us decided to walk back up and take a closer look, about half way, we could see the union jack flags the fascists had adopted as their own fluttering in the breeze with Plod amassed around them 3 deep. It was then a red flare came shooting out from the sidewalk whizzing into the flags and those holding them..it seemed to be the catalyst, bottles and bricks rained down from the heavens...Stickmen in their snakeskin loafers, turbaned teenagers and scruffy students all getting in on the act...Mickey was the first, " have some of that"...more in frustration at Plod for his own experiences, it was payback time......It must have been a good 15 minutes of us enjoying ourselves lobbing any debris we could find lying around into the Nazi scum.....Soon after Plod got themselves tooled up with riot shields and batons - the first time such equipment was used on the mainland. The waves of police baton charges were cracking head indiscriminately. It was a good idea of Timmy`s, " lets get back to the clock tower"...and off we went, to find the place more rammed than before... Well as history acknowledges, the Nazi`s march never reached the High Street.....The severity of the counter demo had the desired effect and Plod had had enuff , they stopped the fascists in their tracks and marched them back to New Cross station to be loaded on trains out of there. The day had been a victory for black and white, standing together to paralyse the National Front who never really recovered after this event. In November of that year the Anti-Nazi League was formed and forged what was to become a crucial link with Rock Against Racism (RAR), a group of musicians, photographers and artists allied with the punk scene. Who organised bands with reggae artists in unprecedented mixed events....The RAR gigs culminated in two huge anti-Nazi carnivals and marches, one at Victoria Park, East London, in April `78 and another in Brockwell Park, Sarf London, in September that same year. The carnivals each attracted over 80,000 people to demonstrate their opposition to the NF and hear acts such as The Clash, Tom Robinson, Steel Pulse and X-Ray Spex. They catapulted the ANL into national consciousness. "You Gotta Know Whatcha Doin"
"Dance To The Drummers Beat"